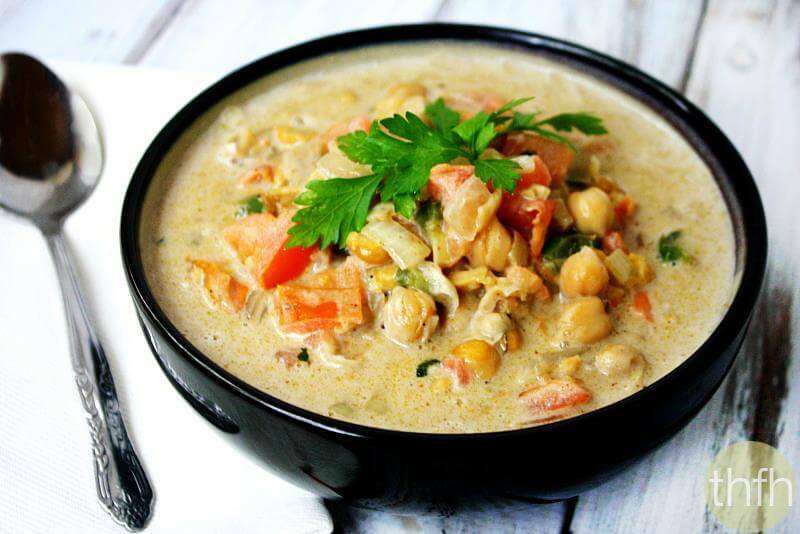 Clean Eating Spicy Chickpea and Tomato Soup…clean eating recipe made with clean, real food ingredients and it’s vegan, gluten-free, dairy-free and ready in less than 15 minutes. This Clean Eating Spicy Chickpea and Tomato Soup is so quick and easy to make you probably won’t believe it. It can be ready in less than 15 minutes and you have a warm, cozy winter soup perfect for Meatless Monday’s or any other evening you need an easy dinner. If you like the warm aroma of cumin and garam masala and a little bit of spicy from jalapenos, you will fall in love with this soup. And, it’s also a good source of vegan protein from the chickpeas with 12 grams per serving. 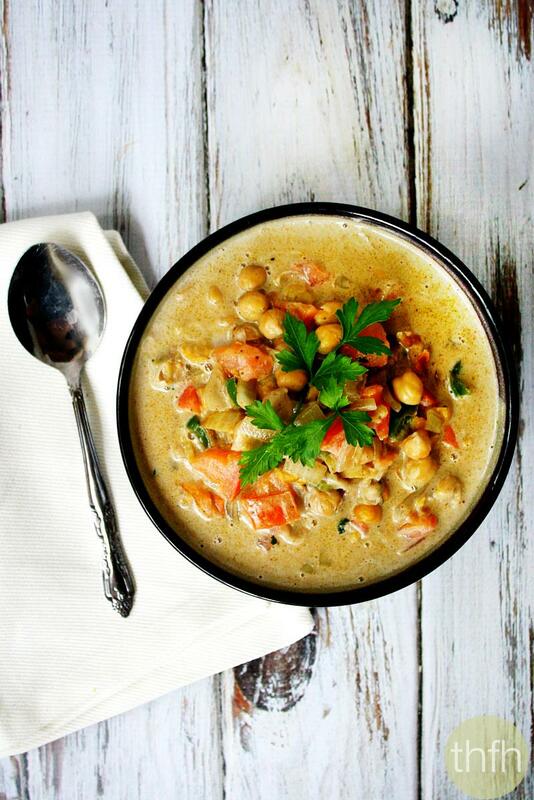 Want more healthy soup recipes? Check out Creamy Red Lentil with Kale Soup, Cream of Mushroom Soup, Vegan Stuffed Pepper Soup or my Clean Eating eCookbook with an entire chapter of 20 healthy, clean eating meal and entree recipes you will love! Tip #1: Feel free to adjust the seasonings to your preference, or to double the recipe if you need more than 2 servings. Tip #2: Sometimes I like to mash the chickpeas to give it a thicker consistency, but that’s another option if you’d like to try it that way. Tip #3: The chickpeas I used were “unsalted”, so if you use a salted variety, you may need to adjust the amount of Himalayan salt. Step 1 In a skillet, add the olive oil, onions, cilantro, cumin, garam masala, turmeric, ginger, Himalayan pink salt and saute on low/medium heat until the onions become translucent. Add the tomatoes, jalapenos and chickpeas and continue to stir on low/medium heat for 2 - 3 minutes. Add the coconut milk and continue to stir on low/medium heat for another 2 - 3 minutes. The recipe and photographs for "Spicy Chickpea and Tomato Soup" by Karielyn Tillman of The Healthy Family and Home are licensed under a Creative Commons Attribution-NonCommercial 4.0 International License and cannot be used without my written permission. i just made a double batch and its very good. i will next time use coconut oil in place of olive oil and if you add lime juice at the end, it changes everything!! much more depth and interesting flavor in my hungry opinion 😉 thanks for this and for letting us share our thoughts/ideas!! Hi there Suzi! I’m so glad to hear that you enjoyed it and ~really~ like the substitutions you made (or will make), especially the lime juice! I love lime juice and never thought to add it but I bet it would taste amazing! Thank you for all your lovely recipies, made this yesterday & it was delicious. Hi there Anne Marie! I’m so glad to hear you enjoyed the recipe! My husband and I made this soup for dinner this evening and it was so flavorful and delicious! We didn’t have fresh tomatoes so we used a cup of the Mur Glen canned fire roasted tomatoes and it worked perfectly. We only wished we had made a double batch to have more leftovers! Thank you for all of the great recipes and information you share. I can always count on anything I make of yours to be a success! Hi thee Sheryl! I’m so glad to hear you and your husband enjoyed the soup and love, love, love the idea of using fire roasted tomatoes…I bet that gave it a more intense tomato flavor. Yum!! This soup looks delicious, and perfect for wintertime (and anytime). Pinning this!